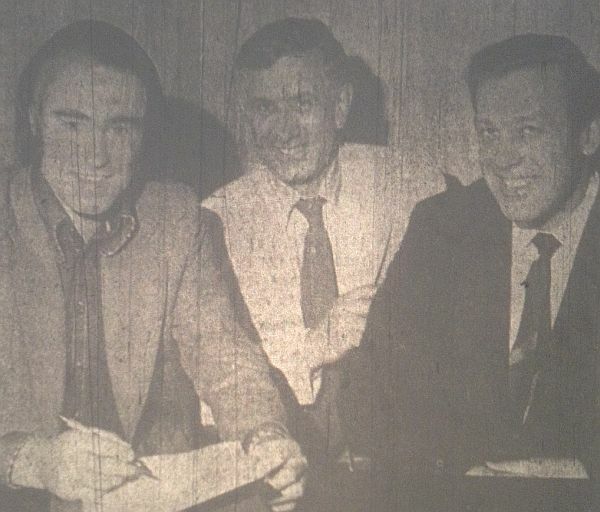 When Burnley won the Second Division in the 1972/73 it was thought that we would need to make a number of signings to compete in the top flight again after a two year absence. With the dust settling on a superb season, manager Jimmy Adamson teased the local press with hints of a first signing. He told Peter Higgs and Keith McNee, the reporters for the Burnley Express and Burnley Evening Star, that he was showing a keen interest in an experienced centre-forward in his late 20s whose club had confirmed they would listen to offers for him. He refused to reveal the identity of the player to the two press men to prevent any possible auction because, he believed, other clubs would jump in and outbid us if they knew he was available. Adamson did confirm that he was hoping to have talks with the player in the near future and that any transfer would be dependent on the outcome of those talks. He added that we would be ruled out should his club ask silly money for him like £100,000 and said he was confident we could get him for a fee of not much more than £30,000. That snippet from the Burnley manager came on 27th May 1973. It didn’t stop the local press from speculating but Burnley moved quickly and on the 29th, just two days later, Adamson spoke again to confirm the signing of Swindon Town centre-forward Peter Noble for a fee in the region of £35,000. The Burnley Star reminded us that it was Noble who had scored the goal that broke our hearts on a cold December night in 1968 at The Hawthorns when Swindon ended our hopes of reaching Wembley in the League Cup Final but said the player was ready to make up for that by scoring goals for Burnley. That was it, the only signing that summer, but what a signing he proved to be.